whew! last weekend is nothing but a hectic blur of family, friends, a christening, a wedding, drinks and some serious food spreads. time for a more relaxed week and bit more time in the kitchen. weekend: i still had time for a lunch with my parents on saturday, before we headed out to my cousin’s christening. we kept is simple with sandwiches, but sandwiches that were rich, spicy, crunchy and so good for you that everything in them was practically alive. multi-grain bread, a dressing of parmesan, dijon mustard, red wine vinegar and olive oil, to top off avocados, cucumber, a mix of sprouts, raw goat cheese and a smear of hot sambal oelek. last night: soup and rice! sounds totally boring, doesn’t it? it’s not, it’s really comforting and after two hot spoonfuls, addictive. it’s something my family served to us kids when we were reeeeeally little–but it was lipton’s chicken noodle soup back then, with cooked until kid-friendly mushy white rice. 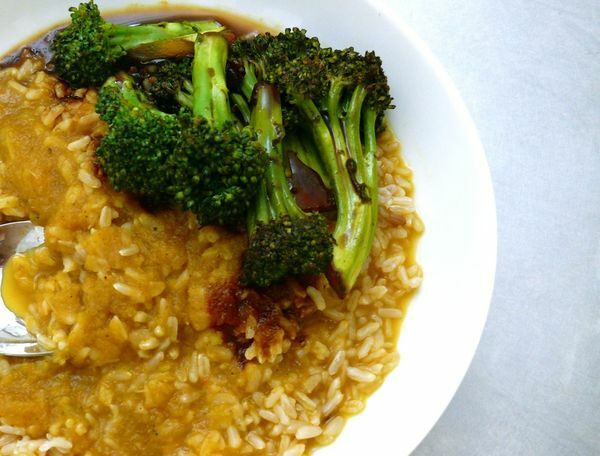 in my version i threw some vegetables into some broth, cooked them, blended the soup, and poured it over hearty brown rice. on the side, some sticky-sweet and salty broccoli. i’m testing that recipe and will be sharing it very soon–i love it! tonight: out with the girls–a wine bar i think. i made extra soup, rice and broccoli because i knew i’d need it to stretch out over two take-to-work lunches. wednesday: one more test of a hazelnut-crusted goat cheese toasts and salad recipe. it will require cleaning the oven a bit so that the broiler doesn’t make a spill in there start smoking… really not looking foward to that. i need to get into the habit of cleaning more as i go. i’m terrible at that. friday: to friends’ place for dinner and we’re cooking together i think. i love cooking with my friend–i always learn something from him. i’ll report back on what we make–but i would love to make the broccoli for them. it needs one more test because i’m tweaking something and i think they’d really like it. then…the long weekend, baby! will visit a farmer’s market maybe, but will definitely treat myself to a nice dinner out too. your turn. what are you making this week? what are you craving? I’m thinking about making home made burgers this weekend as it’s the first (no kidding) sunny weekend of spring. With lots of caramelized onions. Any excuse is good for caramelized onions. kim–i never ended up making the grilled cheese sandwiches, so i too am still craving them! hope your weekend was very sunny! This recipe looks great 🙂 Thanks for sharing!